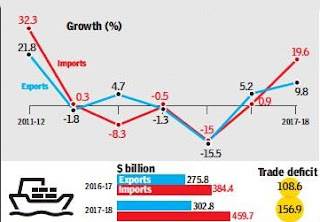 But, exports dipped 0.7% in March to $29.1 billion, led by a decline in shipments of gems and jewellery and petroleum products from the country. This was the first decline in four months as oil exports dropped 13%, while gems and jewellery exports fell nearly 17%. During March, import growth too slowed down, rising 7% to $42.8 billion, leaving a trade deficit of $13.7 billion. In 2017-18, trade deficit was estimated to have widened to $157 billion, compared to $109 billion in 2016-17. While exporters’ lobby group Fieo said that the overall number was positive, it warned about the adverse impact of protectionism and geo-political uncertainty.